At HospitalPortal.net, we introduced our Policy Manager module in 2007 and quickly realized there was great potential to use it to manage documents other than policies. Over the last few years, more and more of our clients have begun to use the module to manage other documents, primarily contracts and forms. This post will provide a few ideas to hopefully identify a few specific ways you can make the most of the policy management tool you already have. For contracts in particular, the workflow including review, collaboration, and approval, is quite similar to that of policy management. By utilizing features such as keywords and related documents a bit differently, our Policy Manager can provide a robust and comprehensive contract management tool. 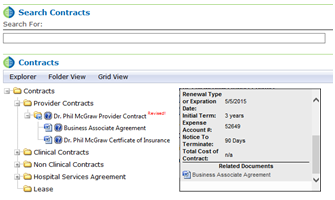 For keywords, we often see Renewal type or expiration date, initial term, notice to terminate, and accounts information utilized and noted on info cards. Business Associate Agreements, Certificates of Insurance, and other related documents can also be attached on the info card to conveniently provide an entire file in one location. For forms, in many cases the process is a bit different, but using the Policy Manager workflow does provide the oversight that is often missing in managing forms across many departments, units, and ancillary services. Some forms could be automated by creating custom fillable forms, however many forms such as those with bar codes and triplicate forms will never be able to be automated. That doesn’t mean the existing workflow can’t be used to manage the approval and review process. Many hospitals scan and manage such forms in the system and also use the system to centralize forms whereever possible. One client recently undertook managing forms in the system as a project and discovered that their small hospital had over 125 different consent forms floating around in different areas of the hospital! Last but not least, custom electronic fillable forms can be used to automate logs and entries often processed as part of quality management, particularly in labs. Fillable forms, workflow, and task management to assign monthly logs and more are great ways to make the most of the tools already in place to support policy management. Many of you may have other ways and ideas that your hospital has considered leveraging policy management tools beyond simply to manage policies. Please share your thoughts and ideas–we would love to hear them!